Heat the oven to 375°F. Spray a 12 x 8 x 2-inch shallow baking dish with vegetable cooking spray. 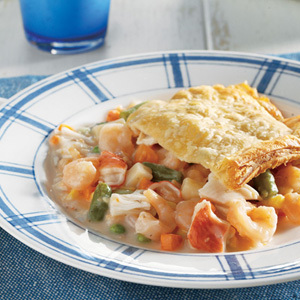 Stir the soups, milk, hot sauce, vegetables, shrimp and imitation crabmeat into the prepared dish. Unfold the pastry sheet on a lightly floured surface. Roll the sheet into a 10 x 9-inch rectangle. Gently roll the pastry onto the rolling pin so that you can lift it and gently unroll it onto the baking dish. Crimp or roll the edges to seal it to the dish. Bake for 40 minutes or until the pastry is golden brown and the filling is hot and bubbling. 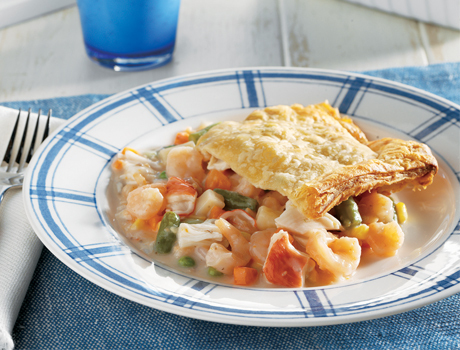 Let the pot pie stand for 5 minutes before serving.